BUYSOUNDTRAX Records presents the original soundtrack to THE SWORD AND THE SORCERER, featuring music composed and conducted by David Whitaker (VAMPIRE CIRCUS, DR. JEKYLL AND SISTER HYDE) for the 1982 fantasy film directed by Albert Pyun (CYBORG, DOLLMAN, KNIGHTS) and starring Lee Horsley (MATT HOUSTON), Kathleen Beller, Simon MacCorkindale (MANIMAL), Richard Lynch (INVASION U.S.A), Richard Moll (NIGHT COURT), George Maharis (THE SATAN BUG) and Reb Brown (YOR, UNCOMMON VALOR). THE SWORD AND THE SORCERER tells the story of Talon, a young prince whose parents, the king and queen of Edhan are killed at the start of the film by evil warlord Titus Cromwell (Lynch), whose victory in battle has been assured by a pact he made with a dark sorcerer named Xusia (Moll). After his triumph, Cromwell quickly destroys the sorcerer to ensure his uninterrupted reign over the kingdom, unaware that Talon, the prince of Edhan has escaped. Armed with his father’s tri-bladed sword, Talon grows into a mighty warrior, gleefully played by Lee Horsley.When he is conned into aiding the beautiful Princess Alana (Beller) rescue her brother, Prince Mikah (MacCorkindale), who has been imprisoned by Cromwell, Talon rediscovers his royal heritage. Meanwhile, Xusia, believed to be dead, returns to wreak his own vengeance on Cromwell for his betrayal, which puts Talon and his army of mercenaries right in the middle, pitted between sword and sorcerer. Released in 1982, a month before CONAN THE BARBARIAN, the film was quickly eclipsed by the box office might of CONAN but it has maintained respect as a cult classic and considered one of its director’s best films. To compose the score for his ambitious first film, director Albert Pyun brought on board David Whitaker, a British composer well versed in scoring films of dark fantasy, having worked both for Hammer Films, on VAMPIRE CIRCUS and DOCTOR JEKYLL AND SISTER HYDE and Amicus Films, on SCREAM AND SCREAM AGAIN. 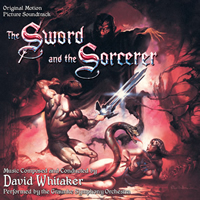 David Whitaker’s score for THE SWORD AND THE SORCERER is a full-blooded late 19th Century-styled orchestral score, built around a handful of primary themes and the composer’s own eloquent orchestrations. Born in Surrey in 1931, David Sinclair Whitaker received his formal music education at Guildhall, studying piano, composition and conducting. In 1962, after having spent some time in the service, he began marketing his tunes around London’s Denmark Street and found some success when he met producer Andrew Oldham, who was producing the Rolling Stones at the time. Whitaker was engaged to do arrangements for some of Oldham’s pop acts of the day. Whitaker also began recording albums of his arrangements. One of these albums caught the attention of the Beatles’ film producer, Walter Shenson, who hired Whitaker to score the 1968 Jerry Lewis comedy DON’T RAISE THE BRIDGE, LOWER THE RIVER. Established by his association with Shenson, Whitaker scored a number of films in quick succession for producer Irwin Allen, including the spy thriller HAMMERHEAD and the Western THE DESPERADOS. Whitaker then scored SCREAM AND SCREAM AGAIN for Amicus Films, which brought him to the attention of Hammer Films, where he would produce two of his more memorable scores for VAMPIRE CIRCUS and DOCTOR JEKYLL AND SISTER HYDE. Later in his career, he collaborated with rock star Jimmy Page of Led Zeppelin on the score to DEATH WISH II. Following THE SWORD AND THE SORCERER, Whitaker slowly moved away from the business, returning in the 2000s to score three dramas. Whitaker died in England on January 11, 2012, shortly after his 81st birthday. He is best known for his dynamic work for Hammer films and this mighty adventure score for THE SWORD AND THE SORCERER. Released on compact disc in 1999 as a limited edition release, BUYSOUNDTRAX Records now presents the world premiere soundtrack release of THE SWORD AND THE SORCERER in time to celebrate the film’s 30th Anniversary, featuring music composed and conducted by David Whitaker, performed by the Graunke Symphony Orchestra, newly remastered by James Nelson of Digital Outland. The booklet contains liner notes written by noted author Randall D. Larson and also includes comments from the composer.